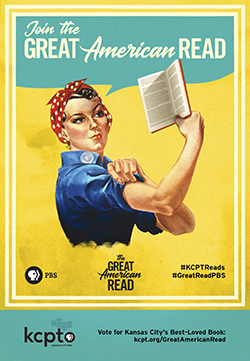 LAWRENCE — KU Libraries, in partnership with Lawrence Public Library, are pleased to announce an exciting series of local screenings and discussions inspired by PBS's “The Great American Read” that will highlight the expertise of five KU faculty members. “The Great American Read” is an eight-part series that explores and celebrates the power of reading, told through the prism of America’s 100 best-loved novels, which were chosen by a national survey. At each watch party, a featured speaker will lead a discussion surrounding the theme of that night’s episode. Most of the events will be held on campus, though a full list of locations and details can be found below. Tuesday, Sept. 18 | 7-9 p.m.
Sept. 25 | 7-9 p.m.
Oct. 2 | 7-9 p.m.
Oct. 9 | 7-9 p.m.
Oct. 16 | 7-9 p.m.
Oct. 23 | 7-9 p.m. These events are free and open to the public, and no reservation is required. Light refreshments will be provided. Please visit LPL’s event page or contact Courtney Foat at cfoat@ku.edu for additional details.